In the 6th century BC, the Athenian Tyrant Pesistratus assembled the rhapsodic jumble of tales of Dark Age Greece into one of the great epic poems – the Odyssey. 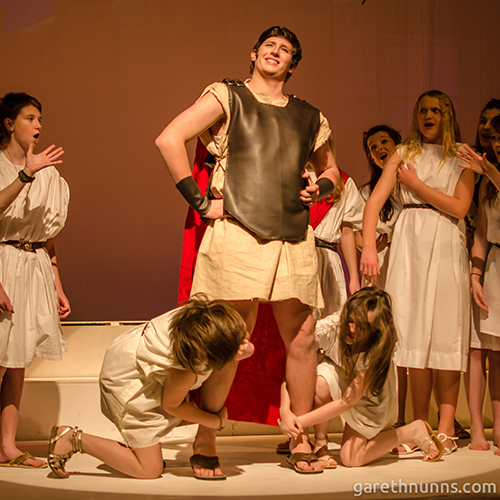 In the same fashion, Audacious Productions from Cambridge have re-arranged the Homeric material into a phenomenal piece of musical theatre. Its hard to believe the cast have just done their GCSE’s in their respective high schools down Cambridge, for they bubble with confidence & assurity far beyond their years. Gelling together like some symbiotic creature, they bob & weave around the stage & relay the story together in an almost pitch-perfect harmony. Geoff Page’s music & songs are charmingly captivating, & the comedy asides are thrown in at just the right times to keep the audience alert throughout the interval-less hour & fifty minutes of the show – after all it is an epic musical.